The title should already make it clear that “Attack of the Lederhosenzombies” isn’t a straight-out horror movie, but rather a comedy that mostly uses its concept to have some fun. In recent years, we saw a rise in horror output from Austria, but most of them were rather serious (“In 3 Tagen bist du tot”, “Blutgletscher”), while this goes full camp. And even though horror comedies with a similar tone, and often even with Zombies in the mix, have recently been quite common, the Austrian touch gave this an edge and let it stand out for me enough to make it entertaining. Granted, I’m not quite sure how big the appeal will be for Non-Austrians, since despite the fact that they mostly talk English (thanks to international tourists that visit an alpine cabin during the zombie outbreak), this is definitely a very Austrian film. This, together with the funnier tone, also set it apart successfully from the otherwise quite similar (especially when it comes to the setting) “Blutgletscher”. 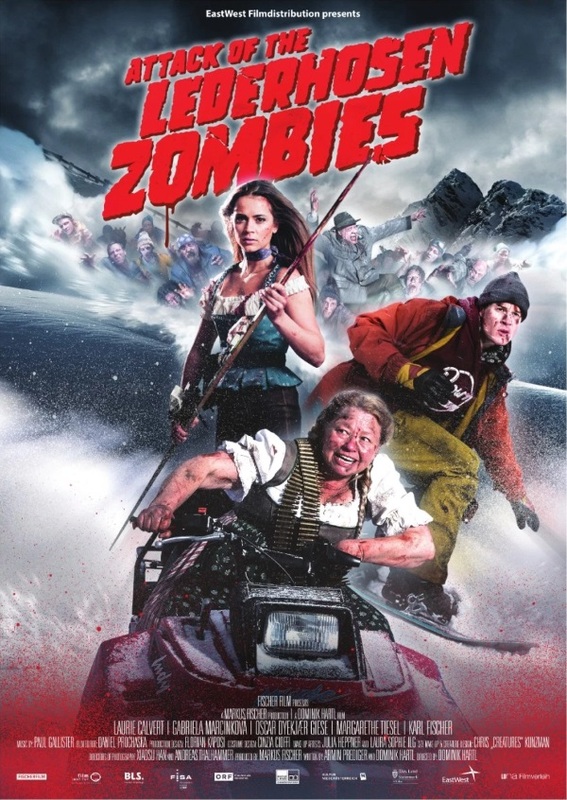 “Attack of the Lederhosenzombies” makes fun of our culture, especially when it comes to winter sports, àpres-ski, alpine cabins, our music etc. – that, for me, was its biggest strength. A close second is Margarete Tiesel as Rita, the owner of said cabin, who gets many of the best scenes of the movie, and steals the show from her younger co-stars (albeit her role was slightly reminiscent of the minister in “Blutgletscher”). There were so many great lines that have cult potential, and which are going to stick with me for a while. The rest of the characters are serviceable, but ultimately nothing special – even though the main couple, Steve and Branka, were slightly above average (compared to similar movies, who usually don’t really put that much emphasis on characters). And even though the characters in itself weren’t overly original, I nevertheless enjoyed all performances (especially Gabriela Marcinková and Karl Fischer). Dominik Hartl and his team also came up with many quite original zombie kills, many of which featured alpine or sports gear – none of which I’m going to give away here – as well as a couple of rather unique scenes and ideas, like with the ice, or the dancing. And I also enjoyed that it didn’t pull any punches when it came to blood and gore. Now, granted, despite the nice alpine setting, broken down to its plot it’s not especially original. Also, don’t expect to be scared – these Lederhosenzombies almost exclusively want you to have a good time. And even though I found the movie to be very funny and entertaining, not every gag hit home. And there was the occasional scene which seemed supposed to be this huge moment, raising cheers and applause from the audience, which didn’t quite get the desired reaction – which, as my friend Lena pointed out, might be due in part to the score, that (even though it was reminiscent of Carpenter’s earlier work, and I usually very much enjoy those synthie-scores) was a little too subdued and moody for its own good, and didn’t really fit the exaggerated, campy tone of the movie. Overall, though, “Attack of the Lederhosenzombies” was quite entertaining, and turned out to be the most fun that I’ve ever had at an ápres-ski bar. This entry was posted in /slash, austrian cinema, cinema 2016, movie reviews, new releases and tagged /slash, /slash 2016, Attack of the Lederhosenzombies, austria, austrian cinema, cinema 2016, comedy, Dominik Hartl, Gabriela Marcinková, horror, Karl Fischer, Margatete Tiesel. Bookmark the permalink.